Brussels sprouts also called cabbage sprouts or Mekyabetsu in Japanese are not actually the sprouts of cabbage. One Brussels sprout stalk is said to produce between 50 and 60 brussels sprouts. 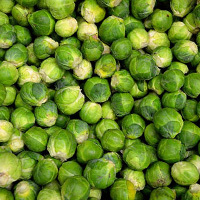 The brusells sprout is said to contain as much as 3 times the nutritional value of cabbage. The calories in Brussels Sprouts per 5g(1item medium) is 3 calories. Brussels Sprouts is calculated to be 50Cal per 100 grams making 80Cal equivalent to 160g with 0.5g of mostly carbohydrates、0.29g of protein、0.01g of fat in 5g while being rich in vitamins and minerals such as Vitamin K and Vitamin C.